One of the best parts of my job is getting to talk to video game creatives, and with a vested interest in the emotion that music can provide, I love learning how a composer brings a game to life. Composer John Swihart isn’t a household name in video games. 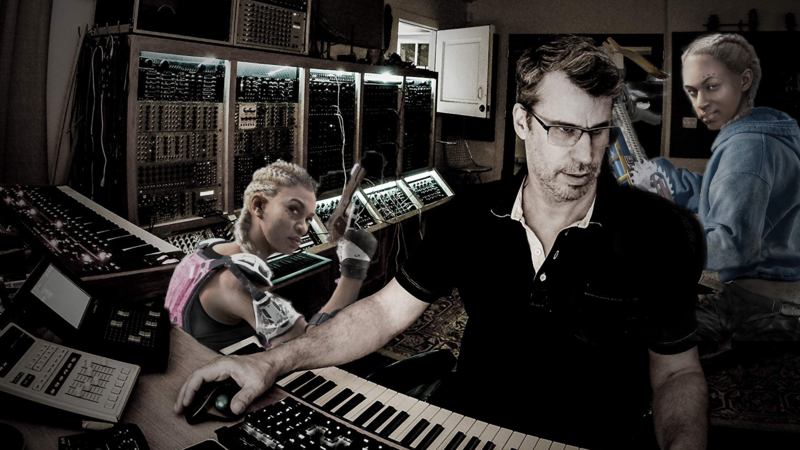 In fact, before Far Cry: New Dawn, he’d never done a soundtrack for a video game. Even if you’ve never heard his work in video games, it’s likely that you’ve heard his work somewhere before. He’s got a lot of experience in movies and TV shows, but his most well known projects were the quirky Napoleon Dynamite and the heartfelt comedy series How I Met Your Mother. So how did Swihart go from working on comedy films and TV shows to the latest entry in the Far Cry franchise? Well, the answer to that is another composer. Swihart’s background isn’t completely within comedy or feel-good emotional sitcoms. He’s got experience working with thrillers and other genres that give him a broad range of experience, even if his biggest credits lie in comedy and drama. Tyler Bates, on the other hand, might have done a few things you’re more familiar with, including small little projects like Guardians of the Galaxy, the John Wick series, and Netflix’s The Punisher. He’s even got his foot in the door on a few games, with his most recent—Far Cry New Dawn aside—being Killzone Shadow Fall. As a friend to Swihart for more than a decade, the two composers had wanted to collaborate on a project for a long time. When Ubisoft approached Bates about working on New Dawn, it was the perfect opportunity for the two to work together. Coming off of Far Cry 5, I loved the sound that Dan Romer had created for the series’ jump to America. His music evoked a sense of worship and religion, but also had this slight uneasiness surrounding it. It was beautiful, but at the same time, it was all designed to make you a little bit uncomfortable, which made the soundtrack extremely compelling. I was curious if Far Cry New Dawn had used any of Romer’s work as a jumping off point, but Swihart told me that Ubisoft had wanted to go in a completely different direction. New Dawn was quite literally a new dawn, and some familiar elements remained, the music was one of the things that set the game apart in time. 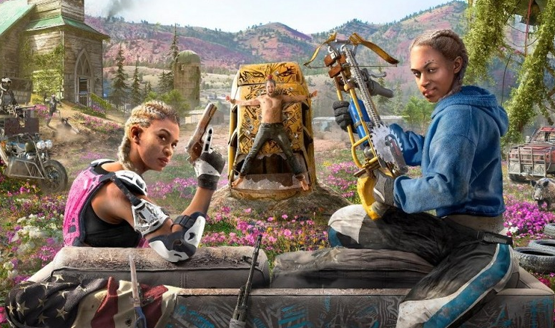 Ubisoft provided Swihart and Bates with images and concepts for Far Cry New Dawn’s post-apocalyptic world. Yes, there was a disaster, but the world is also blooming again with new life. The Father is a much different character than he was 17 years prior, and as such, his themes were completely different from the almost gospel-like music that Romer had created for Seed and his siblings. One thing they knew for sure is that they wanted to make it sound different from most other post-apocalyptic franchises, but otherwise, Ubisoft gave them a lot of creative freedom to play around with. So what does a post-apocalypse sound like? There were a few persistent themes that Swihart and Bates kept returning to as they crafted the music for this project. One was the idea that the world, beautiful as it might be, was like the Wild West, so they pulled some elements of their sound from old Westerns. The other concept was that everything in this world was cobbled together, and they wanted to make the music feel like it was also cobbled together from makeshift instruments. One of the primary instruments they used was a guitarViol, which is a guitar that you can use a bow with (like a violin, viola, or cello). The guitarViol itself is extremely makeshift in nature and can be played in a few different ways to achieve numerous different sounds, so it provided the perfect foundation for them, no matter which piece of music they were working on. While there are traditional instruments as well, there are a lot of deep layers and textures to the music that kind of mask and help create that makeshift feel. 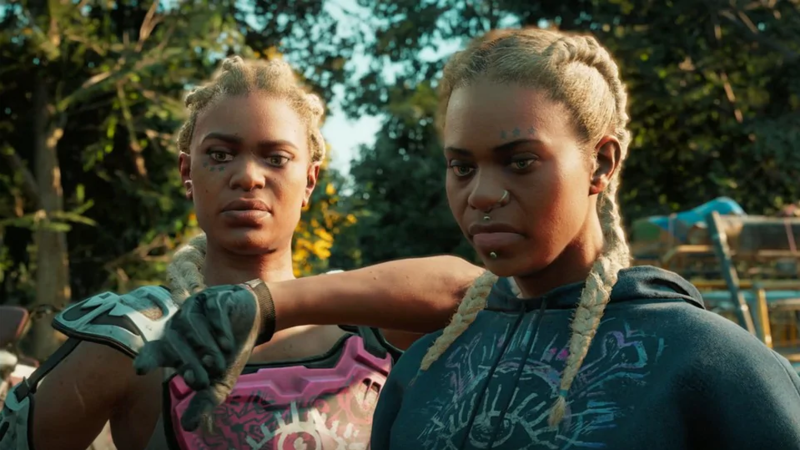 If there’s one theme that really does carry through from Far Cry New Dawn’s music, it’s an underlying unease to every track. In my own playthrough of the Far Cry New Dawn, I noticed that the music fit each moment very well, but that it also created this level of unease at all times; like a minor note that just feels off. According to Swihart, that was completely intentional, and came from a special hammered dulcimer that they used and heavily processed to serve as an underlying texture to the rest of the soundtrack. It’s that part of the music that isn’t so much a piece of the music as it as an added element of sound design that creates that ominous unease throughout, no matter if your exploring the beauty of the world or taking on bunch of aggressive gun-toting people who just want to kill you. Swihart said that the intent was to be disorienting, where music is so often a comfort. Swihart also told me that a large influence was trap music, using Die Antword as an example of the kind of music they pulled from. While the composers didn’t work directly with any of the licensed tracks in the game, the trap music themes ended up pairing very well with some of the heavier darker music that you can hear the bad guys listening to when you go to various enemy camps and outposts. At the end of our chat, Swihart wanted to reiterate that he loved working with Ubisoft, and that he would love to work with them again. While this was his first video game project, there was a lot of freedom there that is sometimes not afforded when you’re working within the more strict confines of film and TV, and he was very happy with how great Ubisoft was while working on the project. Swihart may have comedy films and television as his claim to fame, but now he’s tasted that video game bug, and I get a sneaking hint we may see his name appear in more video game credits in the future. Thank you to John Swihart for taking the time to chat with us about his work on Far Cry New Dawn.